Eye floaters are tiny, cloudy, clumps of cells that appear in the otherwise clear fluid (vitreous) that fills the back three-fourths of the eye. 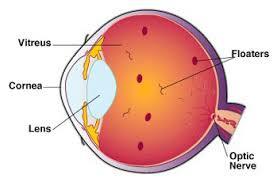 They are sometimes called Vitreous Floaters or vitreous opacities. People see eye floaters as small specks, cobwebs, or clouds moving in their field of vision. They range from being a nuisance that can be ignored, to interfering with essential daily activities such as reading or driving. Eye floaters that are not close to other ocular structures are ideal for laser treatment because they have no blood supply and can not bleed. The floaters are vaporized, not broken into smaller floaters.